New approaches from technology companies and co-working providers across North America and Europe are challenging occupiers’ and landlords’ office-space accommodation strategies, forcing players in more established sectors to adjust how they think about the size, physical form and operational function of their premises. This transformation continues to encourage new development, which is racing to keep up with demand in some markets and being bolstered by a young, educated workforce gravitating to urban centres. According to the report, of the 67 office markets tracked by Avison Young in North America and Europe, which comprise more than six billion square feet (bsf), market-wide vacancy rates declined in 38 markets, remained unchanged in seven, and increased in 22 markets as almost 74 million square feet (msf) was absorbed on an annualized basis. Canada’s office property markets remained sound through the first half of 2018, supported by stable macroeconomic indicators, including healthy employment numbers, GDP growth and a rebounding Alberta economy. However, U.S. protectionist policies and escalating tariffs pose a risk to the Canadian economy and global trade flows, and may lead to moderating growth ahead. 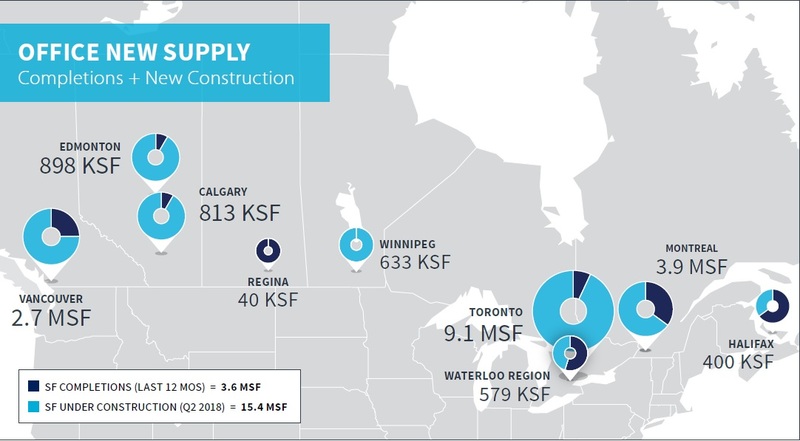 The report shows declining vacancy rates in more than half of the Canadian office markets with suburban markets outpacing downtown markets in terms of absorption (led by Montréal and Vancouver) and new deliveries (led by Toronto, Vancouver and Montréal) during the past 12 months. However, the amount of downtown space under construction at mid-year (led by Toronto) outstripped the suburbs by a significant margin.